As 2017 comes to a close I was looking back at some of my best gaming experiences from the year and there really have been some stellar games put out by dev shops this calendar year. I am going to list some of the best ones I played and the one that edged them all out. Horizon Dawn (PS4/PS4 PRO) - Guerilla Games couldn't have made a more picturesque game with mechanics that kept me engaged from start to finish. I can't give this game enough praise and it easily makes the list. If you haven't played it yet its going cheap and I highly recommend it. Nier Automata (PS4/PS4 PRO) - When I first played this game it reminded me of a PS3 classic (Bayonetta). Art direction, fast-paced action and enemies that will leave you button mashing just to get to the next level and it offers great variety in gameplay too. NiOh (PS4/PS4 PRO) - If you've ever played Dark Souls this game will kind of give you the exact same feeling. It is terribly unforgiving and a worn button pushed will lead to instant death and a stage reset. The bosses are the best bosses I have played all year and if you like a truly challenging game that will leave you screaming and wanting to break your controller this one is it. Hollow Knight (PC) - I love platformers and this game ticked all the boxes for a fun and challenging game. Its only downfall is that it leaves the world too open-ended which then makes you have to remember too much of the map but a fun and easy game. Cuphead (PC) - Railshooting platformer with a good element of difficulty. Super Mario Odyssey (Switch) - The less said the better. I have been a moon-hungry zombie and I play this when I am at airports or killing time. The amount of game-play variety is astounding. Legend of Zelda - Breath of the Wild (Switch) - This a GOTY contender imo and it will win it. What Nintendo did to this series as part of a move-forward approach sets it apart as not only the best Switch game of the year but probably the best game of the year too. Wonder Boy: The Dragon's Trap (Switch) - This is a redone classic with some very well executed and drawn graphics. It's also tedious and extremely difficult but if you liked the classics then this is a must buy if you own a Switch. Resident Evil 7 (PS4) - I was originally skeptical of playing this game because as a person that has played nearly all of them I was worried they'd have gone in the wrong direction from the original Biohazard. But, it exceeded expectations and I don't hope they do another one like this. The Chronicles are fun to play if you haven't played those yet. Divinity : Original Sin II (PC) - If you like RPGs this one is really good. I've only clocked a few hours in it but its miles better than the first one and is a must-own if you like the series. Wolfenstein: The New Collosus (PC) - I was in withdrawal from not having a Doom-styled action game this year but then they give us this masterpiece. If anything the story alone and the characters are worth the price you have to pay to play this. Superb from start to finish. Uncharted : The Lost Legacy (PS4) - Naughty Dog tried so hard and I appreciate the little things like a launch date in India on the very date a festival relevant to the game was on but sadly it didn't live up to anything and I'd say save your money and don't even bother playing it. Destiny 2 (PS4) - Grinding mechanics, no noteworthy game mechanics improvement, upgraded graphics that still look out-dated. They could have made this an expansion pack for Destiny and it would have been better. Player Unknown Battle Grounds (PC) - I tried to get into this but I couldn't in the end. PES 2018 (PS4) - I love the franchise but imo they didn't do enough to warrant top honors. For me its been Nintendo's year. Great shiny console, two elite games in Super Mario and LoZ. Easy to get into games and a growing library with some noteworthy titles outside the top two. Legend of Zelda easily edges out at the top even though it may not be the most prettiest game in the world because the change in game mech and the environmental span (almost GTA-like) alone make me want to say this was the best game I played this year. What did you play this year that made you go "Wow I really love this" or what made you think "This is fresh and really exciting"? I've omitted so many just because I can't think of where to put them. I haven't played many this year as I haven't been into gaming as much as I have done in the past, though just got a Switch after caving in on Cyber Monday (Switch with Mario Odyssey and Mario & Rabbits Kingdom Battle for £300. Normally it's £270 on its own so can't complain) so hoping to play more games in the new year. As for this, the only game that I've put a lot of time in, as you know, was this beauty. Distinctively Japanese (both good and bad), plenty of fun with some stand out moments, lots to do and some comedy thrown in for good measure. Combat was arguably repetitive when generally in the streets, but when you can turn a bloke upside down, jump in the air and slam his head on the floor (I am easy to please after all), you can't complain. I had always heard of the series and how under rated it was, but never tried any of them until I took the plunge with this. I now have Yakuza Kiwami (remake of the first) on standby. I've only played switch games. Loved LoZ, Mario Oddysey and splatoon 2. Found ARMS a tad dull but loved all those others. Based on how much praise you've showered on it now I'll have to give this a go in the new year. I would love to get it earlier but with the holiday season and limited gaming during that time I won't really get a chance to play it. Let me know how your Switch experience goes because I am personally loving mine and have clocked some serious hours on it now. Just got Doom and I plan to boot it up during travel time over the Xmas week. Which one out of the first three did you like the most? I had to go with LoZ because it felt more like an adventure and while Mario will long be played by OCD-driven moon collectors I thought that for a launch title LoZ ticked all the right boxes. Yeah LoZ was pretty amazing. Skyward sword was probably my favorite zelda because of the motion sensor sword movement but the open nature of this one was incredible and absorbing. I'm still playing odysey so its too early to say but i doubt I'll ever put it ahead of zelda. Think its the crowd appeal for LoZ as well. Nintendo broke the shell and finally gave Link a more adult-feel to him. Plus, I have to say that some of the missions were pretty incredible. It's a bit of a slow burner as it swaps between two characters often and graphically it's good but it was a PS3 game originally so not going to blow your socks off. Other than that, I haven't had as much fun on a game in a long time. I need to set up my Switch so will let you know how that goes. 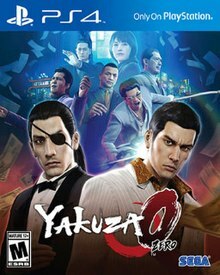 Definitely try the Yakuza games, one of my favourite games. Only surpassed by Shenmue. Some say that the Yakuza games were the spiritual successor to Shenmue. Having played very little of Shenmue myself, do you agree with that? Well, yeah. But they're also quite different, Yakuza is more action-oriented while Shenmue is more aventure-esque. To give you an example, in Yakuza you have to fight to advance in the story, while in Shenmue most of the time you do common real-life things, like asking for someone around town, going to work, train, etc. Being in China in Shenmue 2 was one of my favourite video-game experiences of all times, and i've played tons of games. Have to say I absolutely loved Shenmue when I played it a long time back. Just purchased Yakuza 0 as well so lets see how that goes once the backlog is not as long as it currently is. Was reading some gaming news and playing catchup and LoZ really hit a homerun last year. No surprise really as it was always going to do better than most other games from Nintendo or most other platforms really. Now they need to do a proper Metroid mid-year and collect a trophy for GOTY 2018 without breaking a sweat. I'll have to get Zelda at some point. Been playing Mario Odyssey when I can and have Mario and Rabbids on standby as well. I almost got Rabbids but went for the midrange Fire Emblem they pushed out instead. Then they went and announced that there's a Pokemon RPG, a new Metroid and a new Bayonetta (Switch exclusive) coming and that killed the purchase for me. I was told to pickup Stardew Valley but I don't think I have the time to play something like that anymore. I also want to get Mario Kart as well, but I can't justify buying the same game a second time (still have the Wii U version and the DLC). May get Splatoon 2 as I enjoyed the first one. From what I read getting it for the Switch is pointless as if you have the WiiU version its about the same.